The answer is YES, we welcome new individual tax clients and we make it easy to join with us. Since we recently added two great accountants, we are looking to expand our tax preparation practice. The key information we need is the name, cell phone and email address of a prospective new client. A short introductory phone call is always welcome. We make it easy from there. I make it clear that there is no obligation until we look at important documents and reach an actual agreement. COMMUNICATION: My practice is built on clear and effective communication. That can be a challenge in the pace of life and electronic messages today. The #1 complaint that consumers nationwide have of their accountant is lack of communication. I address this by saying that I respond to all communications within one business day. If you don’t hear back from me within 24 hours, presume that I didn’t get the message. Otherwise you can expect clear, effective, well-documented communication from me within one business day. ONLINE SERVICE: Tax filing work is done online. I enjoy meeting in person for the social aspects, but it doesn’t affect the tax filing services. Increasingly, tax work is complete via text message (although I do require an email address). It doesn’t matter where you are located. DETAILS: The basic information about tax preparation work is all in writing with samples available online: references, the procedure, communication options, time frame, costs, what happens if there are complications, etc. Just see tonynovak.com/taxes. There isn’t any guesswork or what to expect; that wouldn’t be fair for anyone. PRICING: My tax preparation rates are based on published averages that are available online. 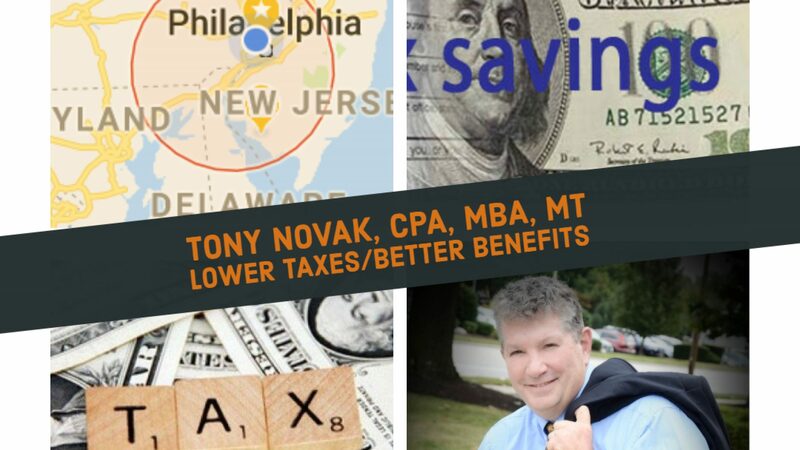 See sample pricing at http://tonynovak.com/tax-services-fees-in-2019-for-2018-tax-returns/. TIMELINE: In most cases the initial contact, through discussion and review, to the electronic filing of the tax return turns out to be a few days. That ensures the highest quality results with minimal stress. If a refund is coming, it usually takes about a week. FREE CONSULT: There is no charge for an initial consultation and a “look/see” of your tax documents. However, that consultation does not mean that I’ll be providing tax advice without an engagement agreement. While the main focus of my year-round practice continues to be representing and consulting with local business owners and affluent clients in the Philadelphia area, I welcome the opportunity to meet and work with individuals from all locations and all parts of life during the tax filing season. I have served clients in all 50 states, DC, and a few overseas. They range from students to disabled individuals to laborers and major shareholders or executive officers of Fortune 500 companies. It is our policy – written into the service agreement – to waive the tax preparation fee for a client who refers four others. This is a great time of year to build mutually beneficial relationships and I look forward to new client inquiries over the next three months. Please feel free to offer any feedback through the contact information on this page. “I look forward to tax season primarily for the opportunity to meet new people in all types of interesting life pursuits”.